Thesaurus of English and Hindūstānī technical terms used in building and other useful arts; and scientific manual of words and phrases in the higher branches of knowledge : containing upwards of five thousand words not generally to be found in the English and Urdu dictionaries / by H. G. Raverty. - Hertford : Austin ; London : Longman, Brown, Green, Longman, and Roberts, 1859. - VIII, 108 S. Lit. : [VIAF ID: 20430079]. • Wikipedia [en]. A catalogue of the Chinese translation of the Buddhist Tripitaka : the sacred canon of the Buddhists in China and Japan / compiled by order of the Secretary of State for India by Bunyiu Nanjio. - [Repr. der Originalausg. :] Oxford 1883. - Tōkyō : Nanjō Hakushi Kinen Kankōkwai, shōwa 4 . - xxxvi S., 480 Sp. 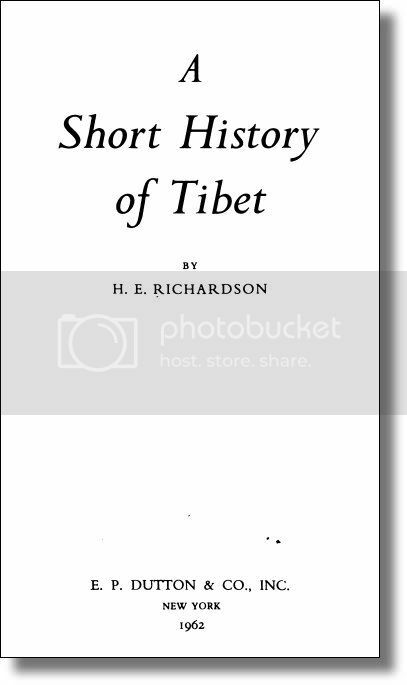 A short history of Tibet / by H. E. Richardson. - New York : Dutton, 1962. - 308 S. : Ill.
Richardson, Hugh Edward (*22. Dez. 1905 in St. Andrews, †3. Dez. 2000 in St. Andrews). Britischer Diplomat und Tibetologe. Lit. : [VIAF ID: 59098537]. • Wikipedia [en]. • The Tibet Album, s.v. Hugh Richardson. Catalogue of the Tibetan collection and other Lamaist material in the Newark Museum. - [Vol. 4:] Textiles, rugs, needlework, costumes, jewelry. - Newark : [Newark Museum], 1961. - vi, 106 S. : Ill.
Catalogue of the Tibetan Collection and other Lamaist articles in the Newark Museum. - Vol. 2: Prayer and objects associated with prayer, music and musical instruments, ritualistic objects. - Repr. with rev. addenda and errata. - Newark, N. J. : [Newark Museum], 1973. - vi, 84 S. : Ill.
Catalogue of the Tibetan collection and other Lamaist articles in the Newark Museum. - Vol. 1: Introduction and definition of terms, symbols in Tibetan Buddhist art. - Repr. with rev. addenda and errata. - Newark, N.J. : [Newark Museum], 1971. - vi, 62 S.